This post is an excerpt from my upcoming course — Mastering HubSpot. Sign-up for the pre-launch list to receive an exclusive discount. This gotcha is one that most HubSpot users have no awareness of, but are affected by. Even if you take no action after reading this, it’s very important to know how identity de-duplication works. Envision the following scenario, if you will. You e-mail a list of prospects to promote an exclusive webinar. One of your prospects, Dwight Schrute, opens the email and thinks, “Wow! This is the most amazing webinar topic I’ve ever seen!” He clicks the link, fills out the web form, and registers for the event. Then, it occurs to Dwight that his collegues Jim and Pam would also love this webinar, so he reloads the landing page and registers them, too. Not only did your champion Dwight reconvert, but now we have 2 new leads from Dunder Mifflin to nurture. Awesome, right? Behind the scenes, all 3 form submissions are merged into the original Dwight Schrute contact record! 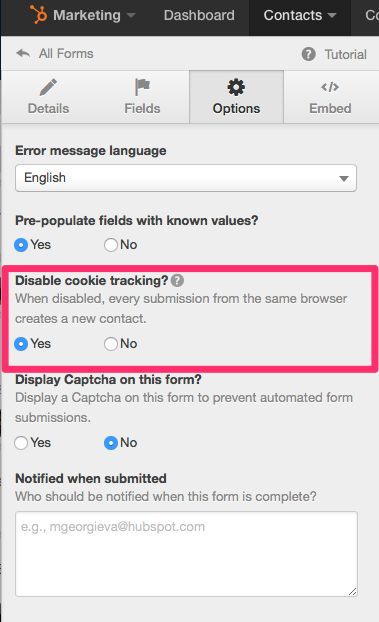 Because each of the form submissions happened within the same browser session, with the same cookies, we don’t get new contact records for Jim and Pam. In fact, the very last form submission steals Dwight’s identity. 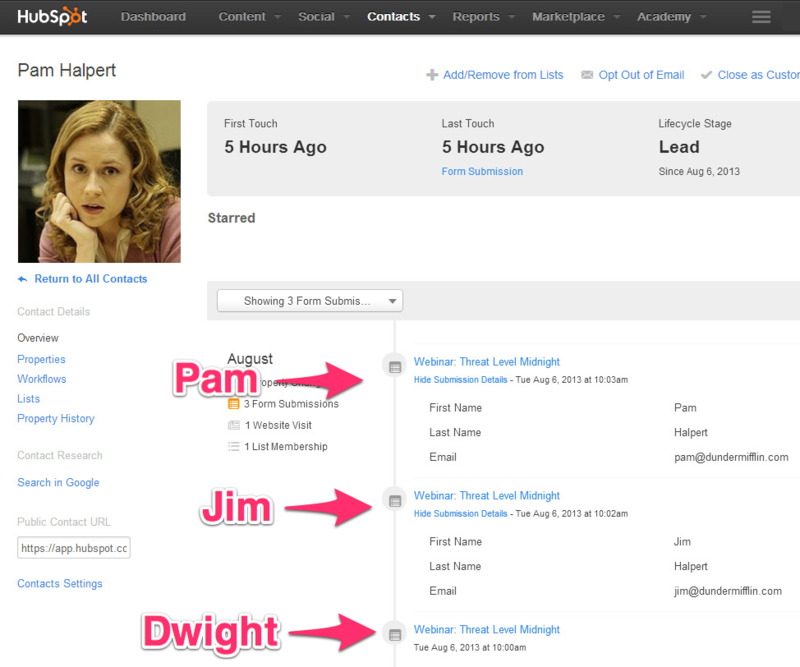 Now Pam is the only Dunder Mifflin lead we have in HubSpot and all of Dwight’s prior activity is attributed to her. Perhaps the worst of it is that you have no way of knowing when this happens. Brand new leads can evaporate and you wouldn’t even know it. The rationale behind the way HubSpot de-duplicates is based on a concept called sandbagging. The idea is this: Dwight browses your website a few times. You’re tracking his movement with a cookie. Eventually, he downloads an ebook with his dwight@gmail.com address because he doesn’t trust you yet. At that moment, all of Dwight’s previously anonymous activity is associated with his new identity dwight@gmail.com. The ebook is legit and two weeks later Schrute requests a live demo of your product from the sales teams. This time, he uses dwight@dundermifflin.com. Now, HubSpot doesn’t want to create a new contact record just because Dwight’s email address changed. Doing so would mean that we wouldn’t associate any of the activity (visits, submissions, etc.) that occurred prior to requesting the demo. By using the cookie to de-duplicate the identities, HubSpot can group all of Dwight’s historical activity under one record. In the example above, and in many cases, this behavior is exactly what we’d want. First, tell salespeople and partners to always use an incognito browser window or clear their cookies when submitting forms on behalf of prospects and customers. If they’ll listen, great! Unfortunately, this won’t work for people outside of your organization (e.g., the Dwight, Jim, Pam scenario), but I’ve found the biggest offenders are in-house. Be the first to hear when Mastering HubSpot is released! Signup for exclusive content, a discount, and progress reports. Or learn more about the course here.